Juicy Goodness, Active Nutritional Info, What Not to Eat & More! 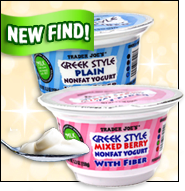 Trader Joe's Greek Style Nonfat Yogurt with Fiber - The yogurt fun just keeps on coming. We've been fans of TJ's fat-free Greek stuff for a while... and this kind is FIBER-IFIC! In both Plain and Mixed Berry, each 5.3-oz. container has 80 - 110 calories, 0g fat, 50mg sodium, 8 - 18g carbs, 3g fiber, 5 - 15g sugars, and 10 - 13g protein (PointsPlus® value 2 - 3*). Find it at a Trader Joe's near you... that is, if it's not sold out -- this stuff is HOT! New Flavors! Trop50 - Our favorite line of reduced-calorie juice drinks is gettin' FANCY. Check out these new flavors -- Raspberry with Green Tea, Peach with White Tea, Pear Lychee with White Tea, and Red Orange (a blend of regular and blood orange juice). WOW! Each 8-oz. serving has 35 - 50 calories, 0g fat, 10mg sodium, 8 - 12g carbs, 0g fiber, 8 - 10g sugars, and 0 - 1g protein (PointsPlus® value 1*). Find 'em in the refrigerated juice section of your local market. Then sip 'em straight or as guilt-free cocktail mixers. Looking for new eats? A few no-guilt goodies recently debuted at popular chain restaurants, so let's talk! Over at Applebee's, there are brand-new Weight-Watchers-endorsed items, not to be confused with the Under 550 Calories Menu offerings... even though all of the new WW-approved meals are under 550 calories. (OK, fine, we're a bit confused.) 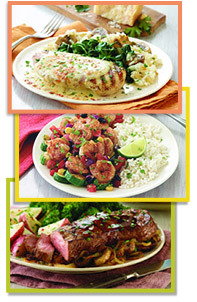 Feast your eyes (and later, your face) on these: Creamy Parmesan Chicken with mushroom rice pilaf and spinach (470 calories, 13g fat, and a PointsPlus® value of 12), Grilled Jalapeno Lime Shrimp with veggies and rice (300 calories, 6g fat, and a PointsPlus® value of 8), and Cabernet Mushroom Sirloin with potatoes and broccoli (460 calories, 15g fat, and a PointsPlus® value of 12). Seriously good options, people! And if the food court is more your scene, Panda Express has a new no-guilt entrée -- Peppercorn Shrimp! A serving of the spiced seafood has only 170 calories and 5g fat (PointsPlus® value 4*). Try out the Build a Plate feature on Panda's website, and plan your meal BEFORE you chew. They Make It; We Eat It. Nutrition Know-How at Your Fingertips! How do you get people interested in nutrition information? Get them involved, and not just by feeding them. New efforts are underway all over the USA! A McDonald's in North Texas has reportedly put up a big touch-screen kiosk where people can browse through menu items and instantly get specific nutrition information for their fully personalized meal, including details like leaving off the mayo or using only half a packet of salad dressing! Super-useful for times when you don't get a chance to check stats online first. And as part of a plan to get college students informed, campuses like the University of Maryland are installing nutritional information kiosks in cafeterias. Maybe this will help fight the notorious "freshman 15"... Meanwhile in Toledo, Ohio, a science center called Imagination Station has an exhibit coming called Eat It Up!, geared at teaching kids about fitness and eating right in a fun and active way. The interactive experience will feature a Heart Rate Rally exercise game, a Food Feud nutrition game, and (brace yourself) The Wheel of Fire: a massive round treadmill that shoots "flames" that rise higher as you increase your calorie burn. WOW... HG field trip, anyone? Cupcakes are cute, but want to make them even CUTER (without cake-decorating lessons) in a flash? Check out Roundabouts Cupcake Sleeves, self-adhesive decorations that wrap around ordinary cupcake liners, giving your treats a serious makeover. There's a design for almost anything you can imagine -- from sushi to sports themes. Pair fun sleeves with HG cupcake recipes for major guilt-free fun! ***When it comes to weight maintenance, what are the worst things you can eat? According to research published in the New Zealand Medical Journal, there are 49 items designated as "Neednt" foods. The list includes the usual suspects like pie and doughnuts, but some red-flagged foods were less obvious -- energy drinks, honey, fruit juice, and even frozen yogurt. Interesting! ***Looks like pouched tuna is setting a trend... Campbell's has a soup-in-a-pouch line on the way! Campbell's Go! will feature unique flavors like Moroccan Chicken and Coconut Curry. Can't wait to see the stats... ***Finally, hats (and shells) off to almonds. Our nutty buddies have been awarded the American Heart Association's official Heart-Check mark. Click here to read more about almonds. ***HG Alert: Do NOT miss this Friday's email... It's our all-new-for-2012 Supermarket List! Complete with the latest market finds and a checklist-style printer-friendly PDF, this list is a MUST-READ. Tell your friends! And that's all we've got. HG out! It's a Bird. It's a Plane. It's SUPER-CUPCAKE! News for all! Click "Send to a Friend" to pass around this info to all your info-loving cohorts. Today, March 5th, is National Cheese Doodle Day. Grab a pen and some paper, and doodle a drawing of your favorite no-guilt cheese. (Ours is The Laughing Cow Light.) Then, of course, have some for a snack.